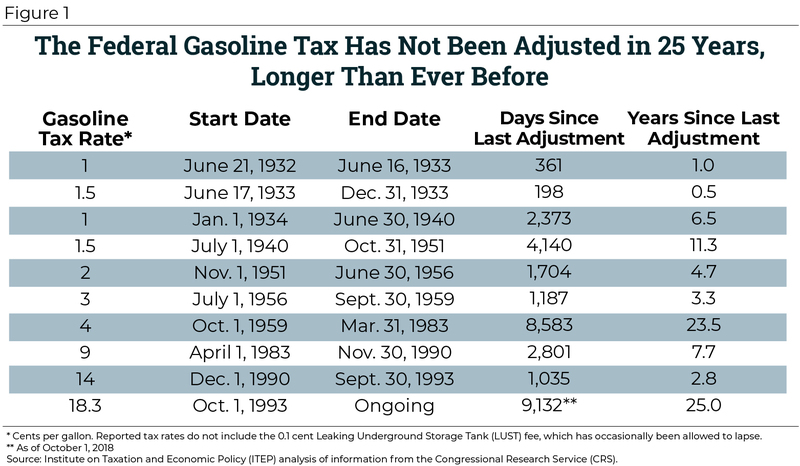 As Figure 1 shows, the current gas tax rate has now been stuck in neutral for longer than any other period since Congress created the tax in 1932. The only other time lawmakers waited more than 20 years without adjusting the gas tax rate was in the 1980s, before President Ronald Reagan helped break that streak by signing a bill that more than doubled the tax. 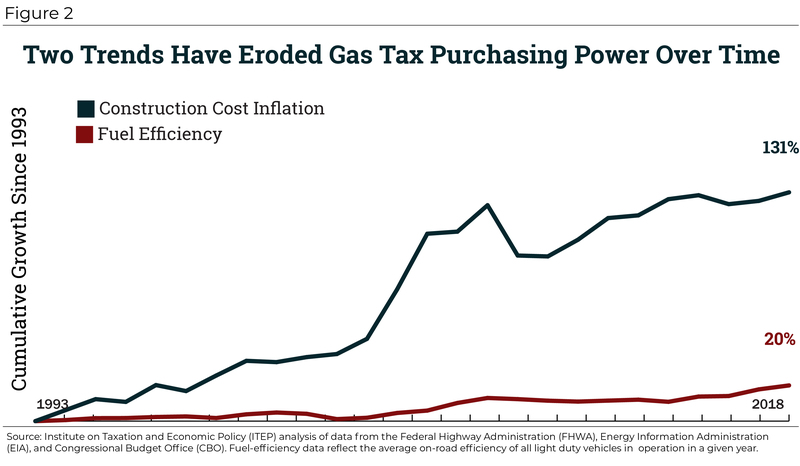 Since lawmakers set the federal gas tax at 18.3 cents per gallon in 1993, both construction cost inflation and vehicle fuel-efficiency gains have taken a sizable bite out of the tax’s purchasing power. Lawmakers’ repeated failure to increase the tax has therefore been a major obstacle to raising enough revenue to maintain and improve the nation’s infrastructure. Between 1993 and 2018, average fuel-efficiency improved by approximately 20 percent (from 19.3 to 23.2 miles per gallon). Assuming a fairly typical 15-gallon gas tank, this means that the average driver can travel almost 60 miles further before they need to stop, refuel, and pay anything in gas tax. Those 60 extra miles of driving are generating wear-and-tear on the nation’s roads, without requiring any offsetting gas tax payment to cover the cost. But fuel-efficiency gains are not the most important factor contributing to our nation’s infrastructure funding shortfall. Highway construction costs more than doubled (a 131 percent increase) over the last 25 years. This rapid growth (outpacing the 74 percent increase in the price of consumer goods and services) is due in part to the higher price of asphalt, diesel fuel, and other petroleum products involved in building and maintaining roads and bridges. Taken together, these two factors have reduced the purchasing power of the 18.3 cent gasoline tax by 64 percent. To make up lost ground, the rate today would need to increase by nearly 33 cents, to 50.8 cents per gallon. To their credit, state lawmakers have escaped the time loop by raising their gas tax rates and, in many cases, reforming their taxes to improve their long-run sustainability. Twenty-seven states have raised or reformed their gas taxes since 2013. 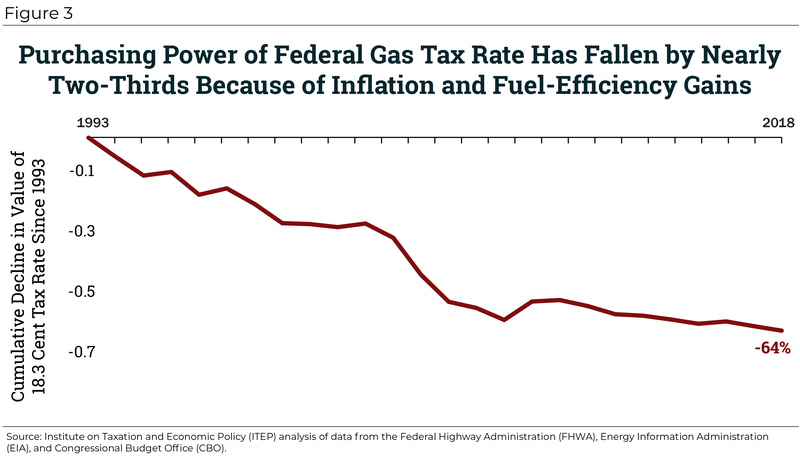 Federal lawmakers who recognize the need for a gas tax increase, but who are concerned with the tax’s disproportionate impact on lower- and moderate-income drivers, are unlikely to support a standalone gas tax increase that would further erode the progressivity of the federal tax code. For those lawmakers, pairing a gas tax with a progressive offset, such as an expanded Earned Income Tax Credit (EITC), could help make the reform more palatable. Many drivers are also sure to question whether a gas tax hike is actually needed, given that Congress just enacted an enormous tax cut that included a $70 billion annual cut for the richest 1 percent of taxpayers alone. Rolling back just half of the tax cut flowing to this fortunate group could raise more revenue than a major gas tax overhaul proposed by the chair of the House Transportation Committee, Rep. Bill Shuster. While the gas tax should be updated, ideally it would be rolled into a broader reform that undoes some of the damage of last year’s tax bill. Following a regressive income and estate tax cut with a regressive gas tax hike is hardly the optimal policy course. In the current political climate, however, principled tax reform may be a bridge too far. It seems that we may all be stuck in Punxsutawney for a while longer.